This month has been hard to sum up in a quote - so that is my quote! As you may know by now, I tend not to share too much on here, and like to keep specifics limited and private. 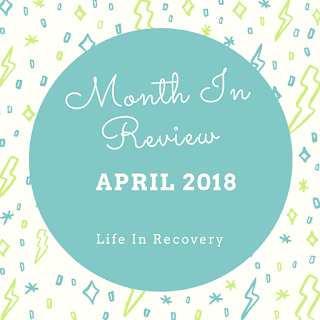 The aim of this blog is to share hope, short-cuts, recovery lessons and provide information to anyone struggling or suffering. With all that in mind I think this month has shown that when aspects of your life are imploding and/or exploding you can still carry on and get the essentials done despite feeling like giving up or wanting to regress back to childhood. April was a month full of stuff. Fun stuff, tough stuff, work stuff and personal life stuff. It is hard to convey just how messy and demanding this month has been across many fronts. I have had to face things I would have rather not, I have had to deal with uncertainty in significant areas of my life, I have made decisions that will change the shape of my future life and I have had to do this with a background of university deadlines and exams. And I have made it through. And I have done that by myself, but also with the support and love of those around me; and for that I count my blessings. In many ways, this has been a torrid month, but looking back I am almost glad of the tough times - for they are what makes life what it is. They are the very problems that I always wished I could deal with when I was unwell - the real life stuff that gets thrown in your way to deal with. I have always said that I never want to live a flat-line kind of life - that the way I want to live will always be like a heart-beat; with ups and downs. This month definitely had all the highs and lows of a very healthy heart-beat! And while I would never wish for troubles, it does make the good times all the more sweeter and I can see the light at the end of the tunnel as we move into a new month. Healthy meal/food of the month: Salad. Nothing beats a decent salad. And with warmer weather comes my craving for salads. Give me a bowl of mixed leaves, some extras like green beans/grated carrot/avocado or all of these and then top that with tuna, falafel, chicken or salmon and I will be a very happy girl. You can see evidence of my love over on Instagram - which features photos and simple recipes to sate any salad lover. My body has also been craving fresh and colourful foods lately, so I have been making sure to listen to my body and give it what it wants and needs. Don't assume that a bowl of salad can't fill you up and is merely rabbit food! Lesson of the month: Realising your worth. Yes, this is another 'not new lesson'. But another that was brought home again this month. I think we can often devalue ourselves, and accept things into our lives based on that lower valuation. But then sometimes things happen that make us realise that we may be able to do better in an aspect, or aspects, of our lives. Whether this is attracting a more supportive/fun-loving/kind/*insert appropriate synonym* group of friends, finding a new job or a myriad other things. This month I was reminded that I can sometimes pursue things that aren't the best for me, accept things into my life that devalue me or put my energy into things that aren't 'worth' it. I am my number one biggest enemy and critic, and that has been brought into sharp focus in recent years, when speaking to others and getting comments that 'jar' with how I really feel about myself. I think this is very common. However, there comes a time when you sit up and realise that you *can* do better or that there is no need to 'settle' or put your energy into something (or someone) that isn't giving that back. It isn't about having overblown or bloated standards, it's more just about HAVING standards. Healthy thing to do: Opening up. Last month I wrote about communication, and this month features communication again. People who are reading this who know me will no doubt not be surprised that this has been a big thing this month. People who don't know me offline will no doubt have had their own problems with opening up - as so many of us do. The saying, "a problem shared, is a problem halved" may not always feel true, but it can certainly lessen the burden and provide support. I, like so many, am not a natural sharer of my innermost problems. In recent months I have been making a conscious effort to reach out to people when I need it, and ask for help or support. Something that comes far from naturally to me. I think people who are the natural carers or go-to people of others tend to be the worst at sharing their own stuff and asking for help - and that can be damaging. I have discussed this many times, for example here and here. This month I have (again) been reminded that I have some of the most wonderful friends. But this month I have (entirely unplanned) shared some of my deepest, darkest things with people who I would have never expected to. These organic 'dumps' all happened in the space of less than a week with three different people, all about the same thing. While it caught me off-guard and proved a little de-stabilising at the time - looking back I am so pleased that it happened the way it did. Clearly the things going on my life at the time had raked up things and I needed to share that, but didn't know how, as other parts of my life were going a bit crazy and my usual 'go to' people were not around. But through a series of weird happenings and conspiracies of coincidence the issues were brought up and out, but in a way that I could just about manage. And while I have not addressed the underlying 'stuff' I now know that there are a few more people in the world who can take the darker, more traumatised parts of me and still see me the same way after - a big concern when dealing with tough topics. So a problem shared may not be a problem halved, but it is a problem shared - and that is a start to coming to terms with issues in your life and seeking peace or a resolution. I highly recommend being a little more open with those around you who you trust. This May is going to be another mammoth one. I have exams, weddings and am moving house. So I am hoping to be all settled in my new home by the end of the month, having got some sun and rest (come on English weather!! ), while having said goodbye to my second year of university.